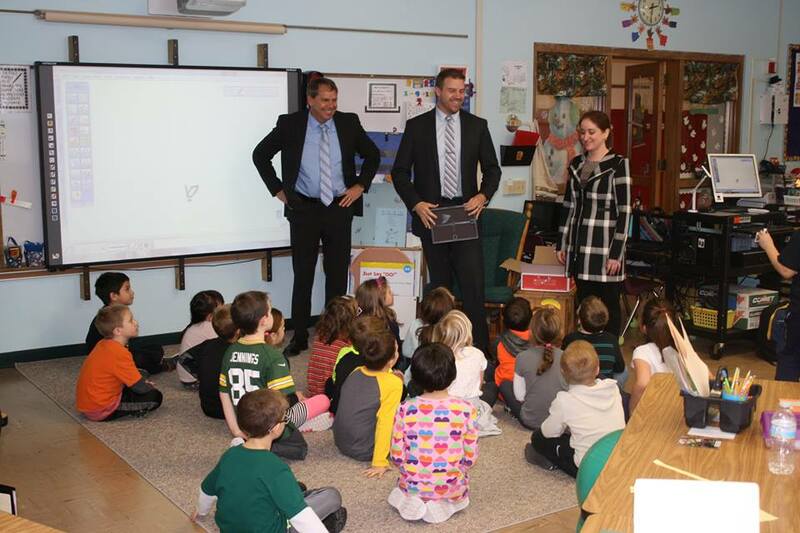 Associated Bank colleagues in Manitowoc recently collaborated with Jackson Elementary to teach two first grade classes about financial literacy. Over the course of two weeks, colleagues Bret Kuether, Scott Throndson and Jessica Mantei taught financial education topics to60 students. They covered the value and importance of money, how to earn and budget it and the importance of saving at an early age. The team concluded the series with a friendly piggy bank competition. Each student received an Associated Bank piggy bank which they were able to decorate with art supplies. The top six piggy banks from each classroom were then displayed at the Franklin branch where customers voted on their favorite. At the end of two weeks, the winning student received a framed award for their accomplishment and a $50 voucher to opening a savings account at the branch. “The students are motivated to put their piggy banks to good use and start saving for their future,” added Kuether. After, the students decided to host a penny war with their piggy banks at the school that raised over $2,000 for a local charity. Associated Bank and its colleagues are dedicated to providing financial education to the communities we live and serve. In 2016, colleagues devoted over 6,000 hours to qualified Community Reinvestment Act volunteer services, including 450 financial education seminars.